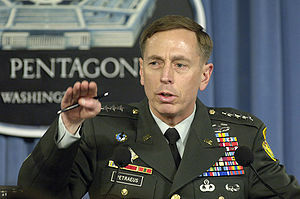 Do we care if Gen. David Petraeus’ ego is so big he has to have a personal biographer follow him around a war zone? Do we care if a smart, beautiful, and physically fit Harvard doctoral student “works her magic” on a general? Not really. But realistically, matters of ego, ambition, and romance are simply “human.” It’s strictly a private matter. Until it begins to corrode the quality of work being done by important institutions, such as the U.S. Military. Petty corruption pervades modern society, from highest to lowest. Like, wasn’t Gen. Petraeus supposed to be focusing his time and energy on leading an army at war? Like, how does one find time to write letters regarding child custody disputes when one is a CIA director, such as Petraeus, or a top general, such as John Allen? I can’t find time to do my laundry. But then, CIA directors and generals have people to do their laundry, shine their shoes, drive their cars, answer their phones. Maybe that’s part of the problem. They’re privileged. They’re different from you and me. People in high places allow petty corruption to corrode their reputations and the effectiveness of the organizations they’re supposed to be leading. We see it in almost every major institution. Congress, churches, business, newspapers, education, family life. (How do you suppose we get to the point of child-custody disputes?) Sometimes the corruption is petty, sometimes it’s humongous beyond belief. The point is this: The decline and fall of civilizations is preceded and hastened by corruption of institutions and individuals. Just my opinion. This entry was posted in Democracy, Life, News and tagged America, Central Intelligence Agency, Corruption, David Petraeus, Ethics, Failure, Family, John Allen, News, Scandal, Society by Editor (Retired). Bookmark the permalink. This is what drives me crazy about this stuff – people focus on the details of the affair and not on what hiding it does to corrode a person’s integrity and therefore, their job performance. “Petty corruption” is a good phrase, although it speaks to the corrupting nature of power, which is not petty. I know. I’ve been struggling for several years to find the right words to describe the general decline in language, civility, effectiveness, competence, ethics, responsibility in my lifetime. Of course serious corruption, for instance the pedophilia scandal in the Catholic Church, takes a serious toll. But petty corruption involving a general writing a letter for a socialite, or a small business cheating on its taxes, has a cumulative effect as well. I have not delved too deeply into this affair as I tend to ignore much of what the media puts out, good or bad. Like stated in the other comment, it concerns me that while this man was supposed to be focusing on matters of grave importance he was more concerned with his personal life. When people are afforded these positions in any genre of employment they have a moral and civic obligation to perform that job. This whole situation is one that has happened time and time again through the ages and until the ego is removed it will happen again & again..